Philadelphia Eagles quarterback Nick Foles (9) fumbles the ball while tackled by Dallas Cowboys defensive end DeMarcus Ware (94) and defensive tackle Jason Hatcher (97) in the third quarter at AT&T Stadium. It was a performance almost no one saw coming. And it nearly lifted the Cowboys to a playoff berth. No, it wasn’t the play of backup quarterback Kyle Orton, who played admirably subbing for the injured Tony Romo. It was the play of the much-maligned Dallas defense that actually gave the Cowboys a chance Sunday against the Eagles. While some were predicting the Eagles would score on every possession, it was the Dallas offense that came up short in the Cowboys’ 24-22 loss. The defense came up with critical stops, especially in the second half, to keep the Cowboys in contention. None was bigger than the three-and-out the Dallas defense forced to get the ball back with 1:49 left. All the Cowboys needed was to get into Dan Bailey’s field goal range for a shot to win, but Orton was intercepted on the next play. "I thought our defense stepped up big time and time again," Cowboys coach Jason Garrett said. "A big story in this ballgame is going to be the turnovers. Early on, the two turnovers led to 10 points for them, and obviously the last turnover snuffed out an opportunity for us to go kick the game-winner." The offense’s woes started early. A promising drive to open the game came to a crashing halt with a DeMarco Murray fumble â his first of the season. That led to an Eagles field goal. Philadelphia scored a touchdown later in the first half two plays after Orton’s first interception. The Eagles took a 17-10 lead into intermission. As 91,166 settled in for the start of second half, a strange thing happened: the Eagles went three-and-out again. The Cowboys converted their good fortune into a field goal, then got another three points when the heretofore silent defensive front made some noise. 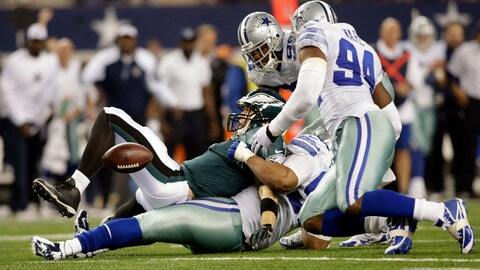 Jason Hatcher crashed through to sack Eagles quarterback Nick Foles, who fumbled. DeMarcus Ware, who hasn’t made a significant play in ages, came up with the recovery. Suddenly, the Cowboys trailed by one, 17-16, because suddenly they rediscovered their pass rush. The Cowboys sacked Foles five times and got him out of his rhythm for several stretches in the second half. The pressure on Foles no doubt aided in holding Eagles wideout DeSean Jackson to a mere three catches for 28 yards and no touchdowns. After drawing within a point, the Cowboys forced another three-and-out. The Cowboys then came up with the biggest stop of the game by stuffing Foles on a sneak on fourth-and-goal from the one. The Eagles did the Cowboys a favor by not giving the ball to LeSean McCoy, their other big weapon, on the goal line. McCoy gained 131 yards on 27 carries, and was particularly effective on a pounding drive in the fourth quarter to put Philadelphia up by eight. But until then, it was the Dallas defense that had done the pounding. And that was without injured middle linebacker Sean Lee, whose absence was probably of more importance than Romo’s. It was Lee’s replacement, DeVonte Holloman, who flushed Foles into taking a sack with two minutes left. That effort gave the offense the ball back and a chance to work for a potential game-winning field goal try. "Time and time again they stepped up and made stops," Garrett said of his defense. "It’s a really good offensive football team we just played, a great rushing team. I just thought they hung in there and they battled and battled and battled. "They made some critical stops in the game, again, to give us a chance to win the thing. Unfortunately we didn’t get that done."